Ethiopian troops have crossed the border into Somalia in significant numbers, eyewitnesses say. They say they saw at least 20 vehicles carrying Ethiopian troops. A few hundred soldiers were seen in Gurel town in Galgudud region and there were other sightings around Beledweyne. Ethiopian authorities have denied the incursion. Their soldiers have not been in Somalia in large numbers since 2009 when they withdrew after a controversial three-year presence. 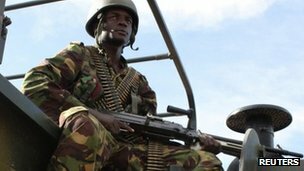 These reports come as Kenyan troops continue their efforts to defeat fighters of the Islamist group al-Shabab in the south of Somalia. If confirmed, this appears to be the largest Ethiopian deployment since the 2009 withdrawal which followed an invasion that was very unpopular with ordinary Somalis. If Ethiopian soldiers were to deploy deep inside Somalia, this would increase the pressure on al-Shabab. Further south, the Kenyan army is working with Somali militias in what appears to be an effort to push al-Shabab away from the border and possibly out of the lucrative port of Kismayo. One MP from central Somalia said he could not confirm exactly where the Ethiopian troops had reached or in what number. But he said their presence was vital in order to help defeat al-Shabab. History shows that military intervention in Somalia is hugely unpopular and can act as a catalyst to unite Somali groups that had been enemies. Although al-Shabab’s strict version of Islamic law is unpopular with most people, that does not mean Somalis will welcome Kenyan and Ethiopian soldiers. This could hamper their effort to defeat the militants. Aid agencies have warned that an escalation in fighting could further jeopardise the efforts to get food to victims of the drought and famine. On Friday the UN said the humanitarian effort had improved the situation but we are told almost a quarter of a million Somalis still face imminent starvation.